To celebrate, I decided to challenge myself to go vegan for the next week - and I hope you'll join in the celebration by trying to go vegetarian for vegan for a week (or even a day!). For the next week, I'll be posting pictures of the vegan meals I eat (along with some recipes too!). I started today with a packet of Quaker Maple & Brown Sugar oatmeal (which is the same thing I eat every morning), so I haven't made any drastic changes yet. The two things I'm going to miss the most this week? Quorn vegetarian "Chkn" patties and cheese sticks. Not sure what is for dinner yet, but I'm thinking I'll make the potato, sweet potato, and tofu bake I made last week. I'll have pictures (and a recipe) tonight! As for nail polish, tonight I'll be polishing my toes with some fabulous Zoya vegan polish (any suggestions on which color I should choose?). *slowly chews her Beefaroni* Awkward. Had I known I'd have reached for Cheerios. 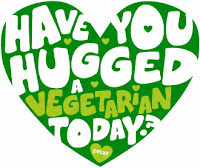 In honour of the day a Meatless Saturday will be held. I say go for Zoya Yasmeen. Its purple, cool and the only one I can remember at the moment. Yikes good luck! I don't eat meat, but I eat seafood and have some weird vegan tendancies thanks to my daughter. My 12 year old became a vegatarian 2 years ago and she is borderline vegan now. She will not eat or wear anything where an animal was harmed in order to get it to her. The most random things are not vegan friendly too, like my beloved Lucky Charms thanks to the marshmallows! I wish more companies offered more vegan friendly options. Wow! That sounds like a challenge. I could probably go vegetarian but I wouldn't want to give up cheese! A week can be short I guess. Good luck! The potato bake sounds good. I look forward to the recipe! Too much of a die hard meat eater to go even vegetarian but I applaud your week of change! I'll be looking forward to seeing the recipes you put up, always good to have some options.